Since DRAM vendors discovered the tRCD memory timing all hell broke loose. On the plus side, we are seeing insanely high clocked memory kits on the market, which is something every overclocker can appreciate, but those come with ridiculous timings. But it doesn't stop there - the marketing machine that comes with this new type of DDR3 memory has moved to CPU-Z validations to prove 'best overclocking capabilities'. That performance is sacrificed to achieve this one moment of stability is apparently not a problem. 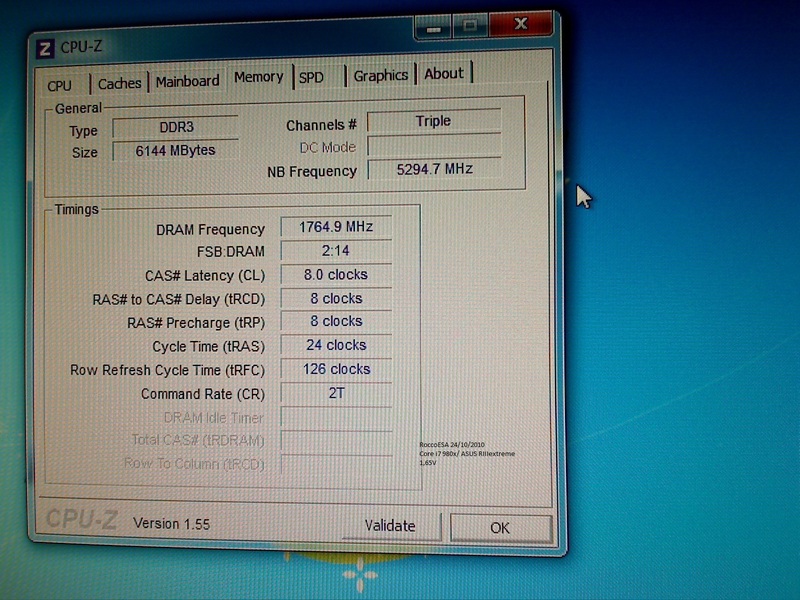 So, to go against the flow of pointless CPU-Z Dram validations we have set up this DDR3 High-Clock Challenge. This, being a challenge that combines both the challenge of overclocking the memory as high as possible as well as maintaining a decent performance ratio. HWBOT DDR3 High-Clock Challenge is closed since 28 February 2011. # Submission verification must be according to the HWBot rules. # We expect everyone to play fair, whoever cheats in this competition is banned from HWBot. # This is not a software tuning competition, but an overclocking competition. Any special software tweaks must be explained to the HWBot staff during the competition and will be published on HWBot afterwards. Anyone going to be having fun with this? Since SB is dropping in early January, any chance of them being added to the competition? I remember the rumors about 2400 being cake on memory! Hyper, PSC, D9GTR (Thuban), ... plenty of choice! First I have to verify the overclocking capabilities of the SNB, though. Awesome. I'm definitely going to be trying it out and hopefully it'll set my Hypers free! Good Luck everybody .very very nice contest . Awesome, I have two memory kits to try on my Clarkdale. I got a set of PSC and Hypers, should be fun. And maybe make MemSet mandatory for this competition as well. Based on this score, I've set the LGA775 memory limit to DDR3-2100. Therefor, I'm expecting 550FSB 1:2 runs (or maybe 660 5:6 haha). Will add memset/cpu-tweaker to limitation list! Might have a go at the deneb one, not got a board for anything else. 1050MHz seems like a good limit indeed! what about 775 DDR2 ? I've set the LGA775 memory limit to DDR3-2100. Therefor, I'm expecting 550FSB 1:2 runs (or maybe 660 5:6 haha). Any chance for P45/X48? Only two combinations will work - 643х7 (1070 mem) and 562х8 (1125 mem). Or someone will try 692х6.5 with 5:8 divider? There is no 6.5 multi afaik. And there is another combination that will work, but currently I don't worry about maxing out the CPU max frequency too much, at first we have to get our memory up to speed. It's called a "challenge", not "children playground"
Massman, there a trouble for stage 4, we can't submit with Phenom II X4 955/965/970 BE. These are Deneb Core no? at least 1300MHZ, i've benched 1227MHZ and Lory'hacker @ 1 260MHz is good. 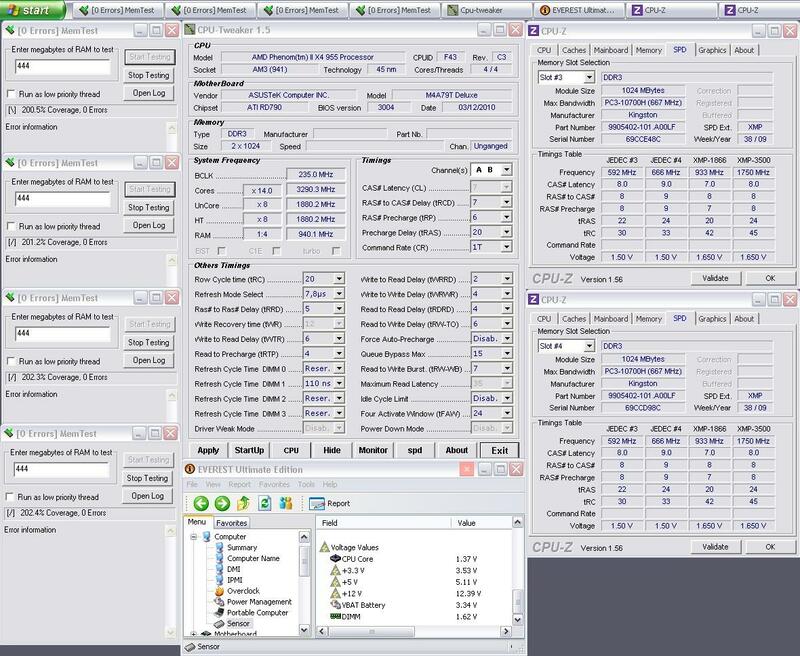 # Only use processors using socket LGA1366. # - A verification screenshot is required. # - Please attach a picture of your overclocking rig. # - Processor speed is limited to 4500 MHz. # - Memory clock needs to be at least 1200 MHz. Yes but no I can't submit with 955be. The bot tells me that I can't submit in this stage with this cpu. And I noticed in the cpu list there's missing also 965 and 970 BE. * - Only use processors based on the Lynnfield core. * - A verification screenshot is required. * - Please attach a picture of your overclocking rig. * - Processor speed is limited to 4500 MHz. * - Memory clock needs to be at least 1300 MHz. Can you make a screenshot of the error? Looks like I won't be entering. I guess my Hypers don't want to do it, even with the 970 and the lower uncore it allows. They're good for 1800 C6, but I can't seen to get even 2000 8-8-8 32M stable regardless of voltage, and they're rated for 2133 8-8-8 24 @ 1.65V. 970 is Deneb right? Isn't the limitation there 900? 2000+ is not a problem, but 2100 is. Why is this no more team challenge? Bloomfield will do 2400 ram easier. If your dropping channels back off RTL a notch.........I was at bclock limit of that board with HT and all cores on......sure it would have ran higher but I never shut cores/ht off for reviews. Dunno ... sometimes we do a team competition, sometimes we do user competition, sometimes country. But wasn't this in the first place team competition? And then renamed to members? Hm, I don't think so. Why memory restriction différence between lga 1156/1366 ?, because spi32m more efficiency under 1366 tri channel. I find that there is an imbalance and I also find it more easier to obtain frequency in 1366 than in 1156.
in short, why not put the same frequency as on similar architectures 1156 and 1366 ?. LGA1366 is more difficult to reach high frequencies with because of the MEM/UNC ratio on Bloomfield and of course the extra stress of 3x DRAM instead of 2. That's why the required memory frequency is lower for LGA1366. wow, just figured out there is a competiton like this going on. is there any word about the prices? good luck for everybody participating! No prizes - this is just a competition for fun . For Clarkdale, it looks like Gigabyte's providing the best BIOS. DDR3-2100 should be possible on all boards, though. Tested 3x 655K and they all did the same clocks under single stage. What about sandy bridge for this? I was going to, but haven't quite figured out what limit to use. 4.5GHz is easy, so memory should be more challenging. But maximum memory clock is just function of the maximum possible BCLK. Only reason to do it, I guess, is to see how well you can optimize Sandy? Guys, how much VTT are you using? can frequency be 4500.x or does it need to be below 4500.x? Has to be below 4500MHz. i was hoping we wernt going to see any 200 * 22.5 on amd! What kind of dividers do you have on your board? That or that it doesn't take mush effort to hit the speeds on AMD. Comp for AMD I think would have been far more interesting with locked multi chips or a fixed multi that you set in the limitations. was subzero on RAM the only way to get 93x 6-6-6 ? here's your M4a79 board in action. No as chew pointed out hypers will do this on air, but I doubt all will do it with less than 1.8+ vdimm -4 on the mem gives me somewhere around 20 MHz on same volt. I could run 937 6-6-6 @ 1.775 (bios set). Pretty low considering these sticks are nothing special, Dominator 1600 cl6. I'll check volt with dmm some day. AMD's IMC freaks at 940+ with deneb especially for booting. You kinda have to finesse it from that point on. I also suggest using older chips, one's before amd started doing low K dielectic on deneb tend to fair better with higher vdimm. weird, must be a CH3 thing then, m4a79T has a diif version, works fine. Just got off the phone with my ln2 supplier, it's gonna be a fun weekend! It was a nice comp Cred to chew* for beating us in stage 4 with a SS.